LOS ANGELES -- 10/04/2018 -- Jukin Media, the global digital media company founded on the belief that the future of storytelling is user generated, has announced the launch of a new offering for the creation and distribution of six-second ads on behalf of advertisers. 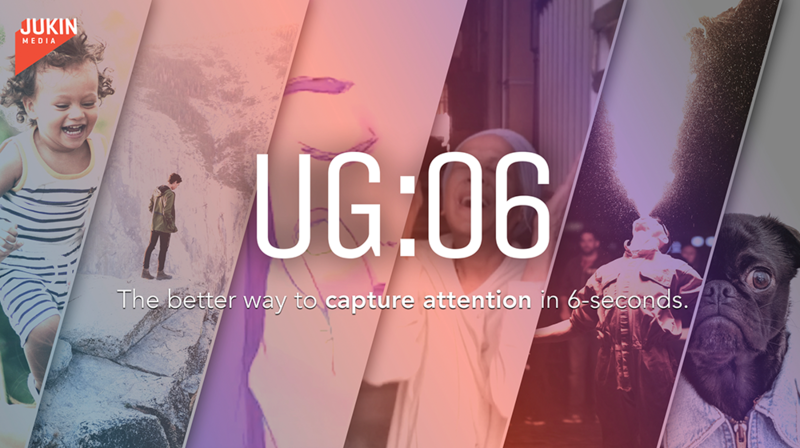 Called UG:06™, the offering stems from proprietary research Jukin conducted which suggests that organic user-generated videos are an ideal vehicle for condensed storytelling because of their short duration and engaging nature. Jukin leverages its expertise in UGC discovery and curation to select videos that fit a brand’s campaign or creative ethos, then adds graphic elements, visual effects, and sound design to create engaging ads that effectively capture attention in six seconds. Finally, Jukin Media’s massive distribution network, with more than 150 million followers across social platforms, provides an ideal distribution outlet for these spots as the network’s UGC-based programming provides a seamless experience from ad to content. Following a stealth rollout period that saw Jukin execute UG:06 pilot campaigns for a global hospitality brand and a global CPG brand, Jukin is now officially bringing the offering to the marketplace. The offering is built on speed and efficiency, allowing brands to run multiple iterations of creative that can be targeted to various audience segments or buyer personas. A survey of more than 500 consumers found that six-second ads that contain UGC video are 55% more likely to be described as unique and 42% more likely to be described as memorable than “traditional” six-second ads. Further, an online panel study of one of the pilot campaigns found that respondents that were exposed to a UGC-based six-second spot reported an 8% lift for intent to purchase over the control group. Jukin Media is a global entertainment company built on the belief that the future of storytelling is user generated. Jukin produces original content for TV, the web, and emerging platforms, and is owner/ operator of a portfolio of social video properties that includes FailArmy, People Are Awesome, The Pet Collective, and JukinVideo; the properties combine for more than 150 million fans online and four billion monthly video views online, as well as more than 70 million minutes viewed per month on OTT services. Additionally, Jukin provides a wide range of solutions that allow premium brands, publishers, and media networks, to commercially utilize user-generated video content. For more information, visit http://www.jukinmedia.com/corporate.